The Learning Accomplishment Profile™ (LAP) is a flexible, adaptable, and easy-to-use suite of products that make ongoing assessments a breeze in one observation-based tool. 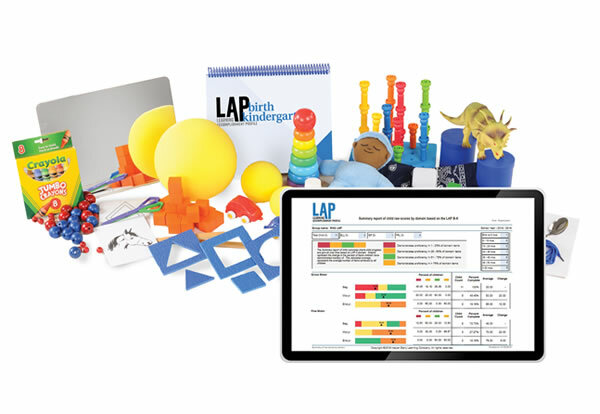 The Learning Accomplishment Profile™: Birth to Kindergarten (LAP™ B-K) assessment is an online observation-based tool that guides educators and clinicians to observe and track the ongoing skill development of children ages birth to 72 months. 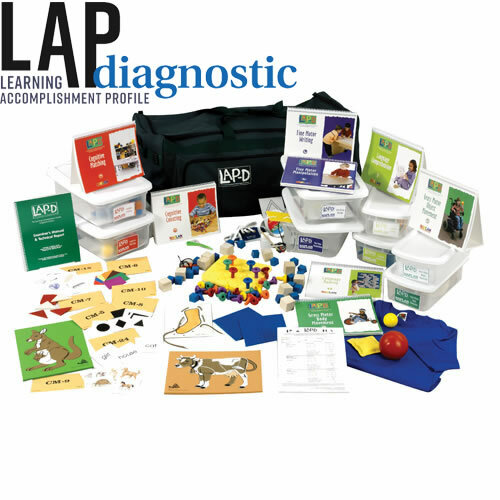 To access the LAP™ B-K assessment, a subscription to the Online LAP™ platform is required to administer and score items. The Learning Accomplishment Profile™ (LAP) is a comprehensive assessment tool that tracks individual child growth and progress toward school readiness across six domains. It provides an ongoing, systematic method for observing the skill development of any child functioning in the birth to five-year age range, including children with special needs. Accessible and research-proven way to track children's progress while on-the-go. Users can document, store and track child progression between assessments in real-time using a phone, tablet or computer. Teachers and/or clinicians may also access and document assessment notes to guide lesson planning and classroom instruction to support acquired and emerging skills. Flexible, adaptable and easy-to-use platform that makes ongoing assessments a breeze. The results of the LAP provide a complete picture of a child's developmental progress so that educators can plan, implement, and monitor individualized, developmentally appropriate activities. The LAP™-D Third Edition provides a systematic method for observing children functioning in the 30 to 72 month age range. This assessment is designed for children with typical and atypical development. The LAP™-D Kit contains a standardized set of the materials necessary to administer each item. A standardized and norm-referenced assessment instrument Generates a complete picture of a child's developmental progress in 4 major domains of development: gross motor, fine motor, cognitive, and language. Each domain contains two sub-scales. Assists teachers in determining the appropriate "starting point" in curriculum planning. Results may be used to assist in the identification of children with disabilities and the subsequent development of an IEP. Results may be used to evaluate a child's entry and exit skills and/or to validate the intervention program. Results may be used to assist early childhood programs in meeting national and state requirements (e.g., Head Start Child Outcomes; state standards). Sequenced cards that are correlated to every item of the LAP™-D sub-scales; useful for teacher planning and for sending activity suggestions home with parents. 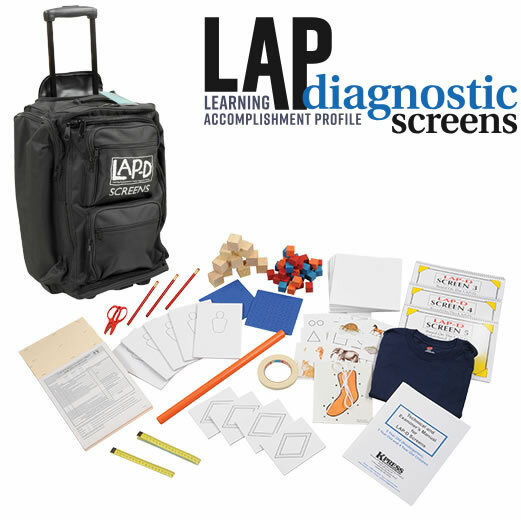 The LAP™-D Screens are the first step in the full screen and assessment process. These normed and standardized tools are designed to identify children who are potentially at risk for school failure. The Screens are fast and easy to implement, yet provide the most reliable and accurate results! Each complete screen kit (one per age level) contains a screening manual, scoring profile, technical and examiner manual, and required manipulatives. Purchase an extra set of the LAP™-D 3, 4, and 5 year-old screen manuals for each teacher in your program. Effectively guides teachers through the screening process. The diagnostic assessment version works with the LAP-D, 3rd Edition a norm-referenced Assessment tool for observing the development of children functioning in the 30 to 72 month age range. 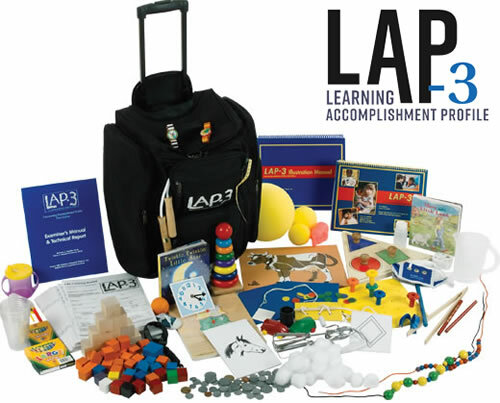 The E-LAP™ and LAP™-3 are criterion referenced strength based instruments that provide a systematic method for observing the acquired and emerging skills of children. Perfect for on-going progress monitoring as well as reporting data three times a year The complete kit includes manual, score sheets and manipulatives necessary for assessing 20 children. 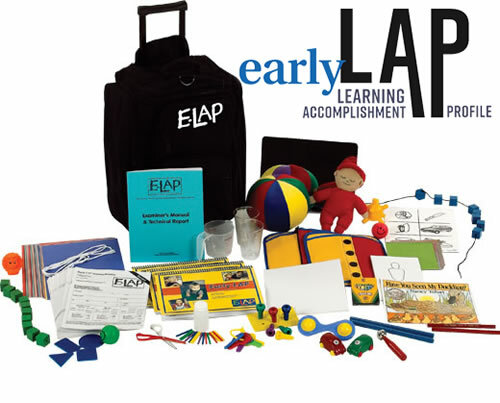 The Early Learning Accomplishment Profile (E-LAP™) is appropriate for all children functioning in the birth to 36-month age range, including children with disabilities. Kit includes manuals, scoresheets and manipulatives for assessing 20 children. Sequenced cards correlated to E-LAP™ domains. Useful for teacher planning and for sending activity suggestions home to parents. Includes 414 cards. The Learning Accomplishment Profile Third Edition (LAP-3) is appropriate for all children functioning in the 36 to 72 month range including children with disabilities. Sequenced cards that are correlated to every item of the LAP™-3 sub-scales; useful for teacher planning and for sending activity suggestions home to parents. Includes 383 cards.